21st May 2016 - Tupelo, Mississippi to Russellville, Alabama. My original plan for today was to go to Hamilton, Alabama – but for varying reasons we had to show our flexibility and change. The main concern was our own safety – we had spent 8 kms on the Interstate 22 (also known as the 78 through this area) last night, and it was a nightmare!! Crazy busy with traffic and a shoulder littered with rubbish – that resulted in Annie getting another puncture after we had been free of them for several days. We needed to find an alternative!!! Then, on opening my emails last evening, I found that our organised warmshower host in Hamilton had moved to Tennessee – which meant we had to search not only for new roads to travel on, but for somewhere else to stay as well! Coupled with my “navigational error” yesterday, I was beginning to wonder what else could go wrong!! They say things come in 3's - so maybe - that is 3!!! I recalled conversation with our warmshowers hosts in Albuquerque, Dan and Sue about a 440 mile ride they had done – the Natchez Trace Trail. This trail goes from Natchez, Mississippi to Nashville, Tennessee and has fantastic scenery, low traffic volumes, and great history of Indian and other uses and events throughout the years. 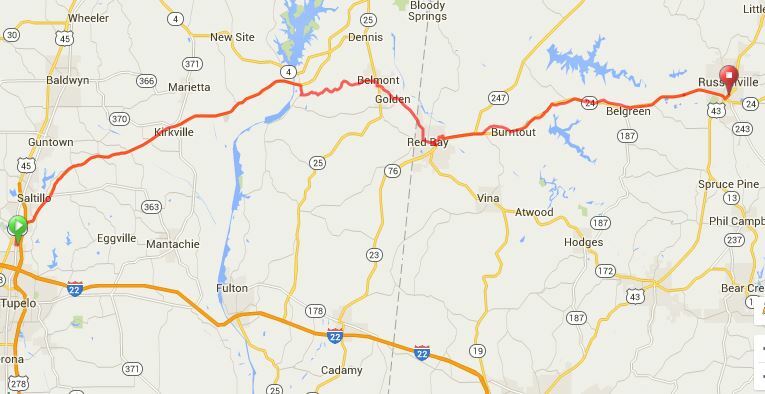 The plan was hatched – if we headed to Russellville (114 kms) we could get to ride 46 kms on the Natchez Trace Trail, wander through some smaller towns on the Mississippi / Alabama border and then finish our day on the “24” at Russellville. While it made for a longer biking day today – it would shorten our Sunday ride and take some hills out of the equation. This appealed to us all – so a quick call to book motel accommodation in Russellville ensured this is what we would do!! Our stay last night was at the Barnes Crossing Campground (north Tupelo) and as a campground it had quite a few nice touches that made it a bit different from others. As we left the camp – the worker asked if we were off to ride “The Trace” – so we smiled and said “yes”. We were on “the Trace” within a mile – and immediately knew we had made the right decision. It was absolutely beautiful, no commercial vehicles are allowed through the route and it was clearly the best road surface we had struck in Mississippi!! We really enjoyed bowling along these quiet roads where the bikes basically have right of way!! We saw other cyclists riding in the opposite direction – the first 2 weren’t interested in communicating, but the latter groups were all very friendly and it was great to wave and exchange pleasantries!! Hiking trails, horse riding trails were all clearly marked as were places of interest. The entire distance was extremely well groomed and park-like, and toilet facilities along the way were immaculate. The only slight downside was no sign at the road we had to exit on – but I had been keeping a close eye on distances travelled and when I thought we were just past where we should be turning off, I stopped to check things out. Sure enough - a small back-track put us on to the road we needed - even though signposts varied from those given on google. We now rode up, down and around through forestry type roads until we reached our lunch stop at the small town of Belmont. “Sparks” had been recommended by people we had asked along the way - so that is where we headed for. They served the BEST food we have had for lunch all journey - finally a small homestyle restaurant instead of a "franchise" chain store!! After lunch it was a short trip to the state border – I know on a very little road – but surely there could have been a better sign signalling a new state we were entering. Check out the photo below!! We weren’t sad to be leaving Mississippi Roads – with the Natchez Trace certainly an exception, and a highly recommended ride to do!! I have added it to the list of rides I would like to do before I die!! At Red Bay – the first town in Alabama - we joined the “24” road which was a 4 lane road to Russellville. It was a return to lovely wide shoulders beyond the “rumble strip” and it felt really safe riding on such a road. It was pretty up and down though, and there were some really good long climbs through this section. We were pretty weary by the time we got in – probably the cumulative effect of day after day on the bike – but happy in the knowledge that tomorrow should not be as bad as was originally planned. So a big thanks to Dan and Sue for recommending the Natchez Trace Trail – a very memorable day on the bike!!! !